Abstract: The loss of lower molars often leads to over-eruption of the opposing maxillary molars, combined with insufficient clearance for lower prosthetic restorations. The available treatment options are either a significant reduction of the maxillary teeth, often associated with endodontic treatment, or removable appliances such as headgear which depend on patient compliance; a complex fixed orthodontic treatment, which may involve unwanted side-effects, or a segmental impaction involving all the risks of surgery and patient discomfort. In previous years, different cases of orthodontic intrusion with miniscrew implants have been described, which make use of four or more miniscrews for bilateral maxillary molar intrusion. In this report, a case is presented requiring bilateral maxillary molar intrusion in order to get sufficient space for an implant-supported fixed restoration in the lower posterior region. This intrusion was carried out simultaneously on both sides by means of three miniscrew implants and a customized transpalatal arch. The results showed significant intrusion of the supra-erupted maxillary molars with normal and acceptable biological response of the teeth and the surrounding bony structures. 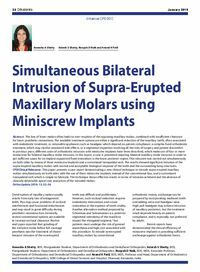 Clinical relevance: This paper presents a case report demonstrating a new clinical technique to intrude supra-erupted maxillary molars simultaneously on both sides with the use of three miniscrew implants instead of the conventional four, and a customized transpalatal arch which is simple to fabricate. The technique shows effective results in terms of intrusion achieved and the absence of clinically detectable apical root resorption of the intruded molars. Author notes: Aneesha A Shetty, BDS, Postgraduate Student, Department of Orthodontics and Dentofacial Orthopedics, Adarsh S Shetty, BDS, Postgraduate Student, Department of Orthodontics and Dentofacial Orthopedics, Roopak D Naik, BDS, MDS, Associate Professor, Department of Orthodontics and Dentofacial Orthopedics and Anand K Patil, BDS, MDS, Professor and Head, Department of Orthodontics and Dentofacial Orthopedics, SDM College of Dental Sciences and Hospital, Dharwad, Karnataka, India. Objective: To explain a technique for patients with supra-erupted maxillary molars seeking prosthetic replacement of lower posterior teeth.